Technology Matters | Technology matters to me and these are my personal and random thoughts / experiences. One UI on the Galaxy Note 9 – Great experience! Samsung presented late last year the new One UI. It has been in beta for a few weeks now, but I finally have it on my Galaxy Note 9 right now (release version). Here are some thoughts about the work that Samsung has done. One of the first things I tried on the new UI were the gestures. The navigation buttons have felt like wasted space since the introduction of navigation gestures on iOS and some Android versions from other manufacturers. The Samsung version is pretty straight-forward, really. Instead of hitting a button, you swipe up from the place where the button used to be to activate that action. There are, optionally, three little lines on the bottom of the screen that help you locate where to swipe. When you swipe on an area, the little stripe that you see goes up and bounces back. A nice animation. Also, in order to activate Google Assistant, just swipe from the centre and hold. In addition, if you swipe right from the bottom centre stripe, you elegantly switch to the previous app (here I have found a bug, as it doesn’t do it anymore the way it is supposed to… in fact, the behaviour is currently very random). In my opinion it works nicely overall and I haven’t turned it off. It of course gives me a bit more screen real estate, but mostly it just looks better and the gesture navigation system sort of feels more elegant. A recent poll on SamMobile had 66% of the people that can use gesture navigation use it, so clearly I am not alone. Worth giving it a try. When you need to go “back” multiple times, hitting the back button multiple times is easier than swiping the back area multiple times. Also, if you were into split screen, you could previously long-press the task switcher button and it would put the active app in multi-tasking view. That doesn’t work anymore. The Galaxy Note 9 has a gorgeous OLED screen and what better way to appreciate it than with a Night Mode where the whole system and system apps get a black/dark background. I had read that in some beta versions you can configure it for a certain time interval or have it turn on with sunset and off with sunrise. This is not yet available in this version. I like Night mode so much that I have turned it on and not turned it off since, practically. I am sure that in the summer time, here in Spain, I would need to switch it off during the day to increase readability, but so far, so good. The next obvious thing is to have all third-party apps that have dark/night modes hook into the system setting and turn on as soon as the system is set to Night mode. That would be pretty cool. The look and feel has really been changed. There are really too many things to mention, and it is probably a good idea to have a look at a hands-on video on YouTube. In general, I really like it! Rounded corners and the like are pretty good looking. It looks also very modern and up to date. Just a very nice looking UI!! One of the main objectives with One UI was to make the UI easier to use on large phones. In the Samsung universe, it doesn’t really get any larger than the Note 9. So, does it really improve one-handed use? Before answering that question, I should note that even before One UI, I didn’t really have much of an issue handling the phone in one hand. Moving the tabs/sections of an app to the bottom makes common sense and probably should have been done earlier, but better late than never. Although the placement is now good, I don’t really enjoy what the tabs look like. Last year, I updated my Galaxy Note 8 to Android 8.0 immediately and I regretted it for 2-3 months. There were so many big bugs (including battery drains and system crashes). Eventually they got there and the current Android 8 version on the Note 8 is great. I have to say that with the massive update that this version entails, it is actually really stable and there are only very small hick-ups here and there, but nothing frustrating. It has only been a few days, but I feel that perhaps battery life has taken a little hit. Maybe. Still, I think they will get this sorted. All in all, well done, Samsung. Always on Display can now be set to turn on for 30 seconds when you tap the screen. This is the way I have it set now, and I really like it. The sound when you connect the phone to an outlet to charge has changed and is lovely. You can turn on Raise to Wake, which means that the phone wakes when you raises it and immediately tries to scan your face. Quite nice. We had expected manufacturer updates to speed up with Android’s project Treble, but we still had to wait for this update until January. It may seem a little late, but taking into consideration the size of the update, the stability and that the Galaxy Note 8 Oreo update was February/March, I really can’t fault Samsung. It looks great and works great and is a real improvement. Keep up the great work, Samsung! More than a year ago I wrote about how Google Pixel’s value proposition and sales strategy didn’t look like a winner. Although, I really like what Google is doing with the Pixel line-up product-wise, it is clearly not a winner in the market. According to IDC, they only sold 3,9 million Pixel phones in 2017. The Pixel 2 is not exactly a cheap phone, particularly the XL version which is up there with the iPhone X and Galaxy Note series in terms of price. The Value Propostion of the phones is solid, though, basically being the iPhones of the Android world, with a very slimmed down software offering, fast and simple user experience, solid hardware, regular software updates. However, where Apple has the brand image (as well as support, physical stores, …) to charge the prices they do, Google does not. Which means that the phones appear (too) expensive. Lastly, the sales channel strategy is not helping. With a lacking awareness and an expensive price point, in order to generate sales you need to have a presence with the operators… putting phones in front of potential consumers. Except for some exceptions, generally this is not the case. We have heard rumours of Google developing a mid-range device, and perhaps that could help with some of the issues I point out above, but quite frankly I am not sure yet. I guess we’ll have to see what the device is like and what the sales channel strategy is about. When Samsung announced the Galaxy S8 and S8+, it also announced its new voice assistant called Bixby. In fact, the S8 models have an actual dedicated hardware key to invoke the assistant. Many people have criticised Samsung for going down this road instead of just embracing Google Assistant. Personally, I am hopeful and I actually think that Google Assistant is leaving the door wide open for Bixby. Google Assistant is arguably the best of the voice assistants out there, mainly due to Google’s advances in natural language models and search technologies. However, it completely relies on server-side technologies and you sharing absolutely everything with Google. This is where I believe lies the opportunity for Samsung. Navigate Home: in order to ask it to take you home, you need to turn on Location History. This makes no sense, as I have configured in Google Maps my home address, so it should simply take me there, but instead requires me to give it access to all my movements. Baby Driver: looking for information on the film Baby Driver. It could just launch Google with this search term, but instead needs access to web & app activity, voice and audio activity and device information. Set an alarm for 17:00: again, it needs acces to the same things, while this is a purely on-device action. Apple is betting that people want functionality like this, but are not willing to give up their privacy. Sure, as a result, it is slower rolling out features, but Siri is actually quite feature-rich already. Perhaps, Samsung should be the Apple within the Android ecosystem, focussing on an on-device Assistant that respects the users’ privacy. 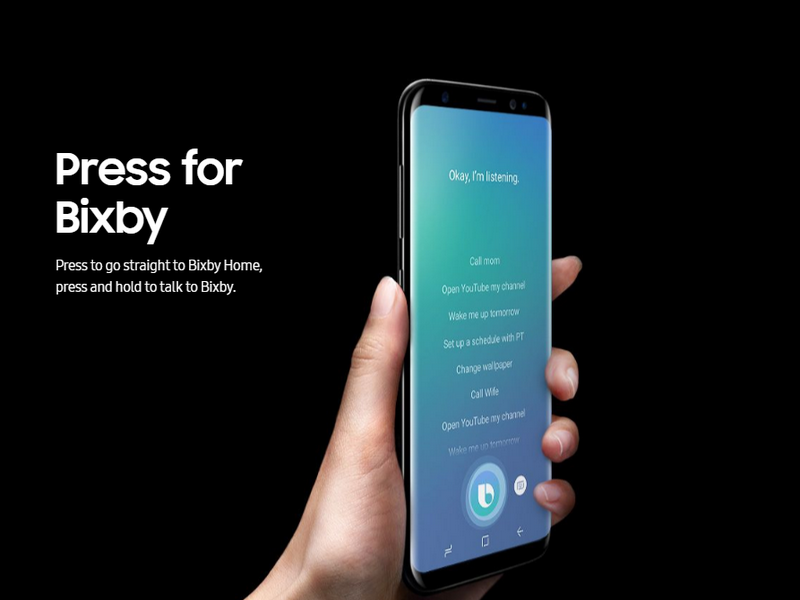 I am certainly going to look into this, once Bixby is more widely available, as I don’t know currently how Samsung deals with the privacy aspect. I admittedly worry that they’ll want to have access to it all, just like Google, but a part of me hopes it will respect the data of the customers that just spend 800 euros on a phone. I’ll keep you posted. Apple’s new iPhone, a strategic mistake? This article is based on rumours, but I felt it was worth writing about it. If we believe the latest rumours, then we can expect Apple to launch in September two updated iPhones – iPhone 7S and 7S Plus – as well as a completely re-designed iPhone – iPhone 8/X/whatever (I’ll call it iPhone 8/X below). iPhone 7 and 7S Plus are expected to be evolutions of the current models, whereas the new iPhone is expected to be substantially different. If you wish to know about all the latest rumours, I suggest you check out iMore .com’s article . On the one hand, it is exciting to see that Apple is finally pushing design innovation after 3 generations of upgrades, but at the same time I can’t help but think it shapes up to be an unfortunate move. Allow me to explain. The current iPhones are already expensive phones. People pay for them, because they prefer to use them, but their biggest complaint is always price. When compared to the rest of the smartphone world, you can see below that the current iPhone 7 and 7 Plus are already quite a bit above what an Android user pays. And the new iPhone may well start above 1.000 dollars. I would argue that iPhones do command a premium – given their good user experience, quality hardware and top-notch after sales service – however, on the design front I am afraid that they are not state of the art anymore. If the current iPhones need anything at all, it would be a reduction in their footprint, i.e. improve the screen-to-body ratio. I was fortunate enough to try out a Samsung Galaxy S7 Edge, and wrote about the experience here . Although I think iPhones have great build quality, nice materials and so on, they can’t compare to what Samsung brings to the table. I found my iPhone 6S Plus dimensions/design to be very outdated. I realise that with the regular iPhone 7 this is less of a problem, but the iPhone 7 Plus is quite an unweildy device. It would greatly benefit from shaving 4 mm of the width and 6–8 mm from the length. This would certainly result in a better user experience (all else being equal, of course). Fortunately, it seems Apple agrees that they can do better, but it also seems that the “regular” iPhones will not benefit from this effort. The new design would be reserved for the new iPhone 8/X. And this is the reason I am calling this possible development quite unfortunate. “Regular” iPhone users already pay a premium in the market. Is it not reasonable to expect Apple to update the design of these immensely profitable phones after 3 generations of limited changes? And not just expect a re-designed iPhone for an even higher price. I think that development would be disappointing. I realise that Apple can get away with it, but I just wish it were different. I am very keen to see how this all plays out. I like using Bluetooth headsets. It is great not to have to worry about cables, and the slight loss in audio quality does not really bother me. With the new generation of Bluetooth headsets – Apple AirPods, Bragi the Headphone, Sol Republic Amps Air, … – I am exploring which one to get. So far, on paper, there does not apear to exist a product without compromises, so I have started to think that I’ll just have to try them. I have started with the BeatsX headphones, from Beats by Dre. I have been using them for about a week and the experience has been very interesting. 1. Charging is done with the lightning cable, which is great as I can then use the same cable for my phone and earbuds. 2. It charges really fast, which is very convenient. Fast fuel is not just a silly marketing term, it does work in practice. 3. Battery life is acceptable for me, and I use it a lot during my workdays. I just charge it in the morning for a moment. 4. They are very easy to pair initially and they connect/disconnect with a simple press of the button. 5. They sit very nicely on the neck and when not in use, the little buds stay together with magnets. 6. The carrying case is minimal, but actually works quite well. The only thing it has me wanting is that it automatically turns off the audio when I take out the earbuds or link them with the little magnets. I guess that was just a bit too much. The user experience is very important, but they are headphones, and they should sound well. So how do they fair? I am no audiophile, but as long as you can get a good seal, the sound is good, rich while still being balanced. Similarly, when the seal is good, the passive noise cancellation is spot on. If the seal is not complete, though, I found the bass to lack quite significantly. Given the importance of a good seal, I should point out that the earbuds come with 4 different tips. I managed to get a reasonably good fit with one of them. The tips are mostly the regular ones, with nothing fancy. The issue, for me, is that when I found a good seal, I started to hear certain sounds very amplified, such as my own breathing, swallowing, even the blood in my ears, which is not pleasant. Also, they really block you out from the world around you. Therefore, it seems that with these headphones I have to choose between good sound or a comfortable experience. That is not really a trade-off I would like to make. Also, there is another important drawback that I would like to point out. The earbuds, while bluetooth, have quite a bit of cable. On the one hand that is very convenient (see my user experience notes above), but when I was wearing button up shirts (or a coat), I would get a lot of microphonics (or cable noise) and movement of the cable would slightly loosen the earbud, causing me to re-adjust the fit a bit too frequently for my liking. With t-shirts this happened a lot less, but it is something worth taking into consideration. They are in-ear earbuds, so if you don’t like that, you should not even try them. However, for being in-ear, I think they are reasonably comfortable. They did not end up hurting, but I guess like all headphones, fit is very personal. In any case, for me they fit better than the Apple Airpods. These ear buds have quite a bit going for them: the user experience and the sound quality are good to very good. However, for the price, I am not sure I would like to accept my two major drawbacks: 1. the trade-off between a comfortable listening experience vs good sound and 2. the presence of microphonics. Like I said, in this segment there are few head phones without compromise, so up next are the Bragi the Headphone. My current mobile phone is the iPhone 6S Plus, but I have been trialling a Samsung Galaxy S7 Edge. I realise that both are not exactly new phones, but still I am finding it to be an interesting comparison of the iPhone and Android ecosystem at large. More and more I am finding that the decision making process of a smartphone go beyond just the smartphone and how it performs. In fact, I will most likely choose to stay with the “inferior” smartphone. To put this comparison in context, I should point out that I am an Android user at heart. Although I have used only an iPhone for the past 6 months, these last few days with the Galaxy S7 Edge have shown me that I feel more at home in the Android user experience. It is only fair to highlight that, as it impacts my personal view points. The design and form factor. The S7 Edge is a very compact design for a large screened phone. It is really nice to handle in one hand. When side-by-side with the iPhone 6S Plus, the plain truth is that the S7 Edge looks and feels from a different planet. The iPhone 6S Plus is rock solid but feels like a truck, and the S7 Edge feels like a nimble machine. Samsung really has done an incredible job designing this phone and Apple needs to step up its game in terms of ergonomics. The screen, including the edges. I have owned many Samsung phones, and I always find that they have the best screens in the market. It is no different for the S7 Edge: the blacks, the colours, the brightness and the resolution are spot on. I have even started liking the curved edges. I thought it was perhaps only a gimmick, but there is something about it. The screen feels more immersive with image and video content. The camera. Everybody knows that the top Samsung cameras are up there with the very best. I am very pleased with it. I find that it shoots better pics in indoor situations than my current iPhone. It manages to capture a bit more light and detail. Besides that, the camera experience is great as well. Extras. Although not critical, the water proofing, wireless charging, and Samsung Pay all help build an attractive package. Delicate and slippery. I could not comfortably use this phone without a case. With this much glass on both sides and such a slippery feeling, I had to buy a case. Now with a sleek TPU case it is a joy to use. Still, Samsung should worry about this sort of thing more. The fingerprint scanner. It is not bad, but too many error readings and a bit too slow. Samsung needs to figure this one out. Firmware updates (or lack there of). You never really know when and what you will receive, even with an unlocked phone. We are still waiting for Nougat and it should arrive soon, but who knows. Lastly, I can’t deny that I am worried about the two biggest flaws in Android: performance takes a hit after months of use and occasionally you experience an unexpected battery drain. Performance was very good in my usage, but only a long-term test can inform about how it maintains that level. The scale of positives and negatives is in favour of the positives, but still I am not sure that I should keep the S7 Edge. The key to that apparent incongruence is that increasingly smartphone purchase decisions will be based on other factors than the smartphone alone. Apple Watch. Although smartwatches don’t appear to be exactly a success, I quite like them and Apple Watch is the best of them (after having tried a couple of Android Wear watches and a Pebble). I could live without the Apple Watch of course, but the biggest problem is that on the Android side I don’t see a clear vision from Google. They have posponed Android Wear 2 and manufacturers like Motorola have indicated they won’t be a launch partner. Uncertainty, to be sure. Homekit. I am starting to play with home automation and really like what Homekit has to offer. I feel that Apple has implemented the right security and usability requirements to make it the best solution. Knowing that I can buy secure components and control them from a central place is great. Again, Google has tried to make this work for Android as well, but it is a real mess. They announced Google Home a long time ago, but that didn’t go anywhere. After that they announced some protocols – weave and brillo – but that also failed to take off in a significant manner. Now they have packaged this all up as Android Things, but I have serious doubts they will get there act together. Apple TV. This is less of a factor, as the Apple TV is a great stand-alone product in its own right. However, the iPhone and Apple TV do complement each other very nicely. CarPlay. Although Android Auto is available, Apple has again an advantage: car manufacturers just need to worry about compatibility with iPhones, all made by the same manufacturer, and often on the latest OS version. Also, Apple is slow at rolling out new features, which is great for car manufacturers. So yes, beyond the apps that you may have bought on a certain platform, it is the investment and tie-in with other accessories/equipment that really makes for a compelling reason to stick with what you have and what works. When relating this back to Samsung, they are in a difficult situation. They are trying to make their own ecosystem with Tizen running on watches and TVs and having their own SmartThings solution for home automation. The problem they face is that they don’t manage to get scale with any of these (except for the TVs, perhaps). Should they totally back Android Wear, Android TV, and Android Things, perhaps these would take off and create an ecosystem that can compete with Apple’s. However, that ecosystem is not on a Samsung level, but rather the platform level. Allthough it may not be ideal, I do feel that Samsung should build more on the Android ecosystem as any ecosystem is better than none, I have come to experience now.